Self-Publisher’s Showcase: Today we are joined by T.R. Heinan, author of L’immortalité: Madame Lalaurie and the Voodoo Queen. Welcome to the Showcase Lounge, T.R. T.R. Heinan: It’s my pleasure to be here. TRH: I write almost every day, or perhaps I should say, every night. I seem to do best late at night when everything is quiet, there a few interruptions, and I can just listen to some music playing softly in the background. TRH: For several years my job required reading treatments and screenplays and I often thought, “I could do better than this”. Not surprisingly then, I considered writing L’immortalité: Madame Lalaurie and the Voodoo Queen as a screenplay. Once I finally got the storyline together, I knew I wanted to publish it as a book. TRH: L’immortalité: Madame Lalaurie and the Voodoo Queen is a mixed genre work; horror and historical fiction. 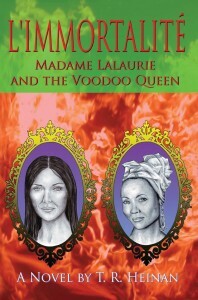 I don’t consider myself to be a horror writer, but the book is based on a legendary horror story from New Orleans and television recognized the subject matter as horror when FX used the two characters that appear on my cover to do a season of American Horror Story, casting Angela Bassett and Kathy Bates to play Marie Laveau and Delphine Lalaurie. I consider my book to be historical fiction. I love history and tried to blend historical accuracy with the best known parts of the legend. Since childhood I have admired the descriptive style used by Charles Dickens and so my goal was to provide a well-researched story rich in descriptive narrative. SPS: Can you take a moment to tell us all about your debut novel, and where the idea for the story came from? TRH: It’s based on the true story of what happened at the Lalaurie Mansion in New Orleans. I knew very little about Voodoo Queen Marie Laveau, and nothing at all about Delphine Lalaurie until I took two outstanding walking tours in New Orleans. French Quarter Phantoms introduced me to the Lalaurie Mansion and immediately I wanted to find a book on the subject. Not much was in print. While I was writing, two non-fiction texts were published, and I wish I had been able to meet those authors while I was writing. Master Jeffrey from Strange True Tours helped me fill in some important gaps concerning Marie Laveau. SPS: It’s evident a lot of time has been spent on research. How long did you spend exactly? TRH: It took two years to do the research and another year to write the story. SPS: Did you already have a substantial understanding of the subject matter, or was this all new to you? TRH: There are two stories layered on top of each other in this book. My fictional character is a man learning to replace superficial religiosity with genuine love and compassion and I suppose I knew a great deal about that, because in many ways he is me. It took the tour guides of New Orleans and a couple of years in libraries and on the internet to learn about the two powerful women who ran New Orleans in the 1830’s. SPS: How graphic did you decide to make the horror elements of the work? Do you prefer to leave things to the imagination, or are gory details part of your style? TRH: I don’t care for graphic horror and believe that a lot of special effects being used in movies and television today is just a poor substitute for good writing. In order to tell this particular story it is necessary to open with a rather gruesome, macabre scene, but I avoid that for most of the book. SPS: Can you tell us about the main characters involved? TRH: Delphine Lalaurie and Marie Laveau lived only a short distance apart, and no doubt each knew about the other, but the cultural and racial situation at the time suggests that they probably did not interact too often. Delphine Lalaurie’s wealth, political connections, and social status in the French Creole community provided her with immense power and influence. Marie Laveau significantly changed the practice of Voodoo in New Orleans and became a legend in her own lifetime. Philippe Bertrand is my protagonist and one of the only entirely fictional characters in the book. He helps me connect these two extraordinary women. SPS: How many of the characters are based on real people, and how many works of pure fiction? TRH: Philippe and his brother are fictional. Just about every other person, even minor characters mentioned in passing, are torn from the pages of New Orleans history and described as accurately as the remaining records will allow. In the case of some slaves, I had to use the records of Delphine Lalaurie’s slaves or use names that were common slave names in Louisiana at the time. One exception is a slave I called Cleopas for reasons that may dawn on readers who are familiar with the New Testament. He and a slave named Elise are essentially fictional and only loosely based on real people. SPS: Have you left it open for you to revisit characters again in future works, or is the book purely standalone? TRH: Marie Laveau’s extraordinarily long life, together with having a daughter with the same name, combined to produce the legend that she could never die, so she will always be available to me for a resurrection. AHS fans may be surprised to learn that the real Delphine Lalaurie was a very attractive woman and that her family and second husband played significant roles in the history of the Battle of New Orleans. Her early life could show up in another book. SPS: We always take a look at an author’s covers; how did the cover to L’immortalité: Madame Lalaurie and the Voodoo Queen come about? TRH: The climax of my story involves the burning of the Lalaurie Mansion on April 10, 1834, so I knew I wanted to incorporate flames. I also wanted to avoid the blue/black tones that have led to so many horror books looking alike. Hollywood artist John Weston combined those thoughts with hints of the traditional Mardi Gras colors, gold, green and purple, and added two original drawings of my cover characters. SPS: We are big believers in the benefits of a good book trailer. Did you create your own, or did you enlist outside assistance? TRH: Several readers have written to say that could not put the book down and read it cover to cover in one sitting. It continues to get five star reviews. 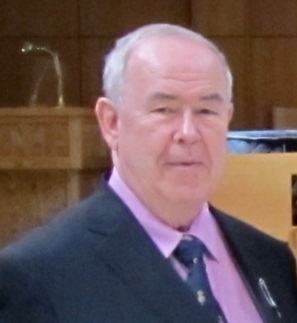 SPS: What’s next on the self-publishing horizon for T.R. Heinan? TRH: I have two drafts that I continue to develop. One about the War of 1812 and one about a medieval Portuguese knight. TRH: Always. It gives the writer far more artistic control as well as decent royalties. I am a big supporter of Indie writers. TRH: I actually never expected the book to be so well received or to sell so many copies. TRH: I’ll give three. First and foremost, everybody needs a professional editor. Hire one. Everybody also needs an outline with clearly defined plot points. Everybody who actually wants to sell their book needs to do some networking and begin to use social networking sites on the internet. TRH: There are a number of writers I follow closely now, but one I really enjoy is Anne Sweazy-Kulju (I also follow her on Twitter), and I just found the first cookbook I have ever wanted to recommend, Mom’s Island Bakins by Martha Char Love. For horror fans, I recommend the award winning anthology titled The Speed of Dark, edited by Clayton Bye. One of the stories in The Speed of Dark is written by my favorite Arizona novelist, Ken Weene. SPS: Thank you for joining us today T.R. All the best for the future! SPS: For more information on T.R. Heinan and his work, please do visit his Showcase Author page here. What a pleasure to read more about author T.R. Heinan and learn all about his experiences writing L’immortalite and his compassionate support of the mission for the children. I am presently enjoying reading his book and it grabbed me on the very first page! How lovely to be mentioned by an author I admire as a writer and a person. What an interesting and kind man Mr. Heinan is. And Lord love-a-duck, but can T.R. Heinan pen a good ghost story. YIKES! Parts of his book scared me witless (a good thing). L’immortalite is a perfect example of what I love most about historical fiction. It is absolutely the best genre when veteran hands warp the history and the storytelling enough to completely blur the lines. I really don’t know how much of the book is true and, yep, that is what scares me the most. I loved his book and I enjoyed reading this interview.